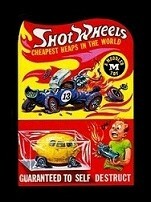 I got mentioned on Greg Grant's Wacky Packages Web Page! A little while back, I contacted Greg Grant (by phone) and told him something was missing on his Wacky Packages Web Page website dealing with the Coffee Table Book section. He had said that 10 anomalies had been on the first Wacky Packages coffee table book and I pointed out an 11th-that Shots in the 5th Series section of the book was missing the words "Delicious Gun Drops". Then he mentioned my contribution in the section mentioning the anomalies and put it in, but never got my name. Well, last week I finally got him on the phone again, gave him my name, and he put it in the section! How about that, huh? Then he gave me a question of his own. He said that El Polluto in the 7th Series section of the book had the name misspelled on the top of the box, with two t's (i.e., El Pollutto). His question was: is that the way it is on the sticker or is it just another anomaly? I said that I'd find out and get back to him later. Does anyone know if this is just another anomaly in the book or is it on the sticker, too? Re: I got mentioned on Greg Grant's Wacky Packages Web Page! rather bizarre that he'd even ask that, as he has a picture of the sticker on his website. I think that Greg knows about it and I also think that what he wanted to find out about it was: is this a mistake common to all of the copies of El Polluto, or was it found and later corrected? In short, is it a 12th anomaly in the book or not? It’s unlikely that something like that would have ever been corrected. I talked to Greg on the phone yesterday and told him that the El Polluto mistake was, most likely, not a anomaly, but a typo that never got corrected. I also figured that Topps must not have known about it until it was practically too late and, or course, by then nothing could've be done about it. He thanked me for my help and that was it. Well, at least I did something to help a fellow collector out. I also told him on both calls that, on his Guestbook on the site, I found some additions and corrections on some of its pages that needed to be fixed and he said that he'd check them out and do so. I guess that I'll have to keep an eye out for those because he's definitely a busy man. If your'e buzy on Gregs websight (wear their's a lot to sift thru and Im shore he'll apreciate the help,) then whose going too keep and eye out hear and look out fore my misstakes and other's? I, of course. Don't worry, I won't let you guys and gals down. I thought Greg's site (or at least the forum) was on auto-pilot and has been for years now? The site is there and is maintained to a small degree, from what I can tell. The forum is kaput, from my point of view. The login page displays, but then hangs. I'm assuming it is disabled. I will and thanks for the advice. I just wanted to make sure, since it hadn't been done at the time, that Greg gave credit where credit was due. After that, the a's and c's that I gave him were just icing on the cake. He said that he's going to look at the a's and c's on the Guestbook and, right now, I've got no choice but to take him at his word. If he sees them and fixes them, that's great! Whether he does it sooner or later is entirely up to him. You know, of course, that I'll be watching for them whenever I can. It's sad. So much information gone from Greg's original forum - research, conversations, pics, stuff from Jay. And the new forum is either defunct, or only certain people can get in. I miss it, but at least here I feel welcome. I'm with you Pat, I miss the old forum of Greg's, But I definitely feel more welcome on here as well. It's sad to hear that all this neat info from this old forum might be gone; isn't there any way to retrieve it at all? And yesterday I found a website called the Wacky Packages Mall that also seemed to be completely empty and unaccessable as well; is Greg's website connected to this one as well? I believe that’s part of his site where stuff was listed for sale. Pretty sure that’s what he called it.